In 2014, thyssenkrupp Industrial Solutions received an order to provide a Polycom High Pressure Grinding Roll (HPGR) for the Soledad Mountain gold-silver project, operated by Golden Queen Mining Co. and located near the town of Mojave in southern California, USA. duct for optimum heap-leaching performance. The HPGR is equipped with studded rolls measuring 1.7 meter (m) x 1.2 m and is powered by two variable speed drives. It was commissioned late in 2015, after thyssenkrupp had trained the plant staff to operate and maintain the unit. Comparative tests in the project phase indicated that the HPGR provided a favorable particle size distribution for a stable and successful heap-leach operation, allowing for increased minerals recovery, at a faster extraction rate. The metal recovery is enhanced, in part, by microcracks in the milled product, which occur as a result of high-pressure interparticle breakage — the inherent grinding concept for this type of machine. Thyssenkrupp recently reported that, as of the end of July, the machine has treated more than 1.26 million tons of gold and silver bearing ore. According to thyssenkrupp, Golden Queen Mining said the HPGR has exceeded expectations, operating consistently at design capacity and delivering consistent product fineness of 70%-75% minus 6 millimeters (mm), a key requirement for producing high-quality agglomerates for optimized porosity and permeability in the leach pad. The Soledad Mountain application, said thyssenkrupp, follows the successful installation of a similar unit at Goldfields’ Tarkwa mine in Ghana in 2008. Valmet has introduced a radio-frequency identification (RFID)-based solution for monitoring the performance of filter cloth used in filter presses. The application, according to the company, has been piloted in customer filtration processes with good results, and initial orders were received in 2016.
mation with RFID technology, the application can analyze the performance of filter cloths and filter. “We are able to utilize information on cloth lifetimes, reasons for cloth removal and cloth consumption to optimize the whole filtration process. In addition, this information helps process operators to better monitor the filter itself,” explained Sanna Uusitalo, product manager–filtration at Valmet. The application uses special equipment and RFID tags that provide information to be used in the follow-up and analysis of the entire filtration process. An optimal process leads to remarkable savings, according to the company. 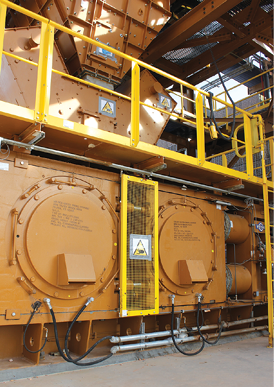 “Savings can be achieved through planned maintenance and reduced filter downtime. The filter cloths and filters will be developed further as more information is gathered about their performance. The application also enables remote support from our filtration experts. By enabling us to see inside the process, the application helps us and our customers to optimize the whole filtration process,” Uusitalo continued. it is currently being offered just to the mining industry, it plans to broaden its use to filtration processes in other industry sectors. 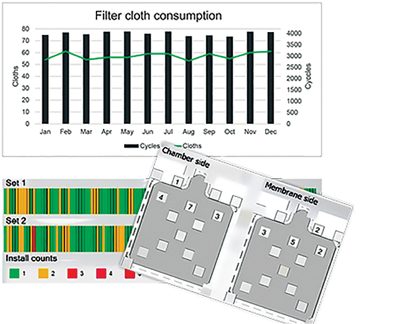 Report examples from Valmet’s new application for monitoring the performance of filter cloth used in filter presses. Sepro Mineral Systems Corp. has acquired Canamix Processing Systems Ltd., which produces agitators, attrition cells, and pumps for the North American and international markets. Canamix has been in operation since 2009 and offers equipment solutions featuring high-quality agitators and the largest peristaltic pumps in the world, manufactured in British Columbia, Canada. ments in existing equipment lines for both companies. Sepro believes Canamix customers will benefit from increased international support for products and services. Canamix products will continue to be sold independently or as part of complete Sepro supplied solutions. Veolia Group, through its subsidiary Veolia Water Technologies Canada, has been chosen by Pretium Resources Inc. to supply an effluent treatment facility for the Brucejack gold mine in British Columbia, Canada. Brucejack is one of the largest and highest-grading gold projects in the world, with commercial production targeted for 2017. Veolia said it will supply proven proprietary processes to treat up to 10,000 m3 per day of effluent water from the mine. The permanent effluent treatment system will involve several technologies, starting with the Actiflo clarification process for primary metals removal. The water will be further polished by a Hydrotech Discfilter to provide added assurance in meeting stringent discharge criteria. Startup of the new effluent treatment facility is scheduled for spring 2017. Veolia said the contract award follows months of collaboration and testing to ensure that the most stringent environmental discharge limits will be met. Test work that was carried out at Veolia laboratories in Montreal has been used in support of the permitting work done by Pretium for the Canadian and Provincial authorities. Veolia started working with Pretium in spring 2014 when the company needed to dewater Brucejack’s underground workings during its exploration phase. Veolia then supplied a Mobile Actiflo water treatment plant, which it has operated since. This temporary facility, according to the two parties, has provided Pretium with much valuable seasonal operational data for future reference. As the Actiflo clarification process will also be installed in the new effluent treatment facility, it gives Pretium confidence that the system meets the requirements of low level metals and Total Suspended Solids (TSS) while dealing with variable feedwater, said Veolia.